Dionaea muscipula. Photo Jonathan Gobbi. “I should note that in those days, professor Bulwer was teaching his students about the dreadful methods of carnivorous plants” an intertitle warns us, in gothic lettering on a green-tinted background “one viewed with horror the mysterious workings of nature”. 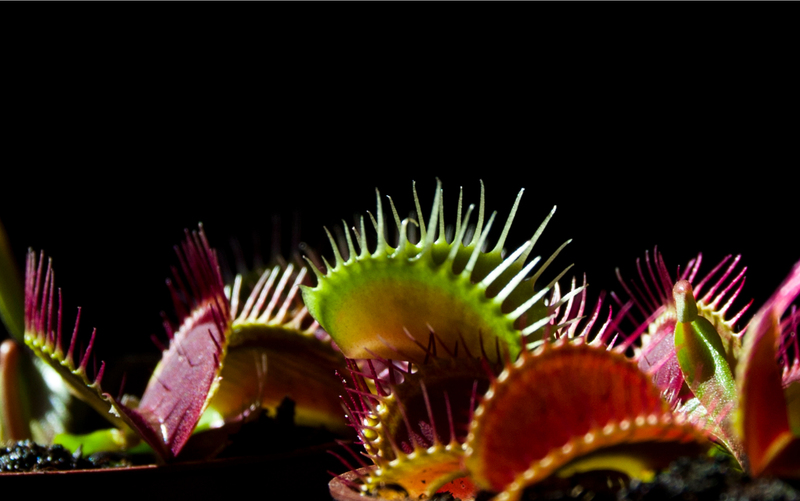 In the next shot, a red-tinted close-up, a Venus flytrap closes her trap upon a fly: it’s F.W. Murnau’s Nosferatu (1922). Where else would you expect the queen of all carnivorous plants to have made her first appearance on the silver screen, if not in the very epitome of terror? They appear terrifying indeed, once you’re aware of what those pairs of red, spiky valves are meant for, yet again: their carnivorous lifestyle wasn’t proven until Darwin’s Insectivorous Plants (1875). Before then, the fascination in regards of Venus flytrap came way more from Eros than from Thanatos – the plant’s sensitivity to touch made it a saucy amusement for the enlightened gentlemen who first studied it: John Ellis described it in 1770 and sent his findings to Linnaeus, baptizing the plant Dionaea muscipula – where Dione is the mother of (or another name for) Venus, while muscipula is actually the Latin for mousetrap. 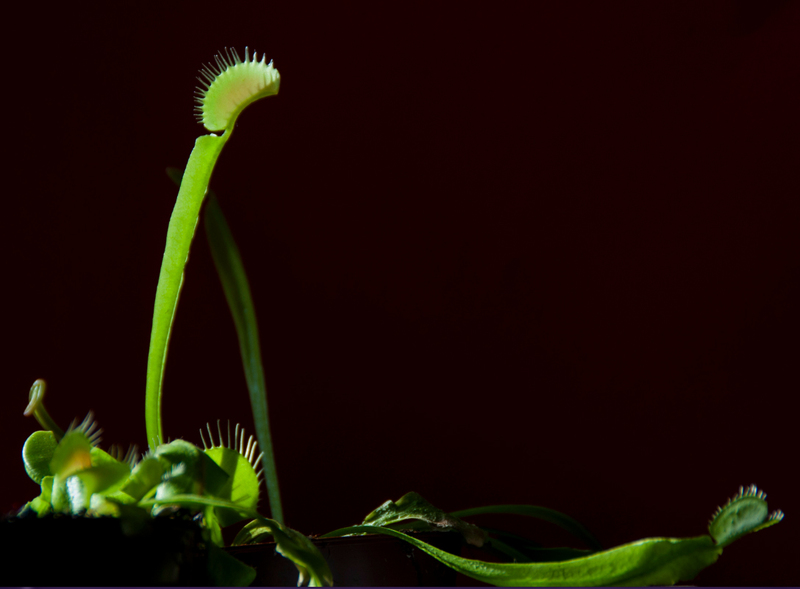 Though its first discoverers were aware that Dionaea catches and eats insects, Linnaeus refused the idea on a religious basis: “against the order of nature as willed by God.” He believed that insects were trapped by accident, and that the plant would have eventually set them free – if it only could have realized. Dionaea is an incredible plant indeed and there are still some who can’t accept its existence or find extraordinary explanations for it – the Creationists consider it a proof of Intelligent Design, the UFO enthusiasts claim it must be an alien species brought to Earth by a meteorite. Unfortunately, there are no meteor craters in the small area – a 120 km range in North Carolina, appropriately situated around Cape Fear – where flytraps are native, and where most of their existing specimen live in the wild. Their habitat lies on the coastal swamps, where they thrive on sandy banks and peaty bogs, rich in water and poor in nutrients – as usual with carnivorous plants. They are small and slow growing, so they tolerate fire and rely on it to periodically suppress their competitors – I mean in the wild, I’m not suggesting you set your house on fire in order to grow them. They are perennial and it takes up to five years to get an adult plant from seeds, so I recommend you go for the easy way: buy an adult one. Dionaea forms rosettes of four to seven leaves that depart from an underground rhizome or bulb-like stem. They usually lay flat on the ground, but in the spring and early summer they can project their leaves up vertically, like little hands trying to grab you. The leaf consists of two parts: the elongated petiole, flat at the sides, is devoted to photosynthesis, while the true leaf has turned into a trap with spiky edges: stiff, teeth-like hair that interlock when the trap shuts. On the inner rim – the green border of the red lobe – are glands that secrete mucilage, and sessile glands are to be found on the lobe surface. Three trichomes or trigger hairs emerge from each lobe: it is their stimulation that causes the trap to shut, but only if two hairs are touched within 20 seconds, or the same one twice and faster – it is a defence mechanism of the plant against wasting energy on inanimate objects, or insects that are too small to bother. The trap snaps in less than a second – and how exactly this happens is still somehow mysterious after almost two centuries of experiments. At first Darwin thought the trap responded to something absorbed from the prey, but all his efforts to prove that failed, as he couldn’t get the traps to shut by spraying the plants with various relevant substances. He succeeded, however, in preventing them from closing by numbing them with anaesthetic, namely chloroform – a line of research that is still being explored today: here’s a recent study on the flytrap’s reaction to ketamine, in case you want to take your plants to Berghain. In the 1880s, Darwin’s friend and collaborator John Burdon-Sanderson discovered he could induce closure with an electric impulse, detecting the first example of nerve-like activity in plants. Later studies have shown how much more there is to it: the electrochemical mechanism behind the trap’s closure gives us an insight into how short-term memory works in plants. When a trigger hair is touched, an action potential is released that increases the concentration of calcium ions. This concentration reaches the necessary threshold only if another stimulus occurs within those famous 20 seconds – otherwise the concentration decreases and the plant “forgets”. The workings of the ion channels are very similar to those we find in animal neurons, so we could learn something about brains from something that doesn’t have a brain, but eats creatures that do have one. Once shut, it takes a trap about 30 minutes to fully seal; in the meantime, the smaller insects that may have been captured still have a chance to escape through the gaps between the spikes – thus avoiding waste of digestive fluids. On the other hand, a bigger prey is likely to move about and struggle in terror and agony, a movement that sounds like music to the plant’s ears. The outer spikes de-interlock and bend away from each other, so that the sealed trap looks like a sleeping eye rather than a mouth. At this stage the inner cavity of the trap works as an actual stomach – Darwin was the first to realize that. Having studied barnacles, a class of arthropods some of which are parasitic and feed by growing roots inside the host, he knew that, however weird it may sound, if animals can have roots then plants might as well have stomachs. While sticky tentacles are perfect for small insects, the snap trap allows capture of much bigger prey, and due to its small height the flytrap’s diet consists mostly of walking small creatures rather than flying ones – beetles, grasshoppers, and spiders. This is perfect if you, like me, don’t really appreciate having spiders around, and it’s also a reason why the plants grow better outdoors, where light is maximized and prey abundant. In my old flat I used to keep a few flytraps on the outer windowsill facing the garden, and they grew really fond of Opiliones, or harvestmen – those things that look like thin-legged spiders but are not – so I woke up every summer morning to the sight of threadlike limbs sticking out of the traps, still shaking while the body was being digested alive. When it was time to bring the plant indoors I just couldn’t take it, they looked like bouquets of spider legs. I threw them away. If you grow them indoors you should feed them every once in a while: growing guides recommend dried bloodworms that you can buy as fish food and rehydrate – I haven’t tried that yet. I tried live worms and totally recommend you not to: The worms can easily eat the trap from the inside and escape, sometimes even after they’ve been already cut in two, and they will keep wiggling about in your garden till you lose sight of them – it’s just gross! Luckily, in my new apartment there are plenty of insects coming from the nearby park, so I can spare myself this ordeal while the plants grow happy on my windowsill. The pots should be always sitting in a tray of distilled water that should never dry out – actually, this is the method I currently use for all my carnivorous plants: every plant has its own individual pot, and they’re all soaking together in a flowerpot saucer that’s as long as the windowsill, and filled for two-thirds with distilled water. If your flytrap plants are healthy, they will try to flower by sprouting a vertical, cylindrical stem from the rosette’s centre: I recommend you cut that off as soon as you spot it, as flowering weakens the plant so much that it may stay floppy for a long time afterwards, depriving you of a spectacular eating machine to show your friends. In my opinion those small, white, five-petal flowers that bloom high over the plant are not worth it, but I’m aware there are different schools of thought on the subject. The Venus flytrap requires winter dormancy, which really means it falls asleep in the winter – it needs fewer hours of light (easily accomplished in Berlin), less water and also lower temperatures (not so easily accomplished if your windowsill is above a radiator. I will move mine to the living room window as it’s rarely heated in winter, and we’ll see). 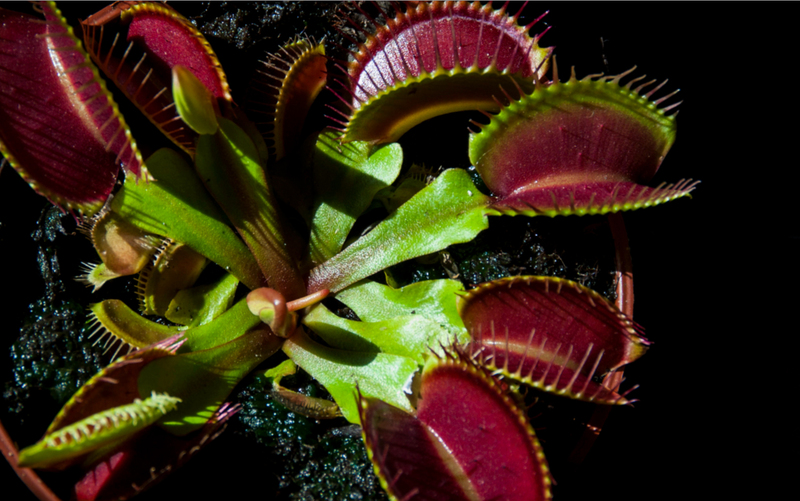 You should not feed it when it’s dormant, it can’t handle it – you could end up killing the traps or the whole plant. Dionaea is a monotypic genus: D. muscipula is its only species. 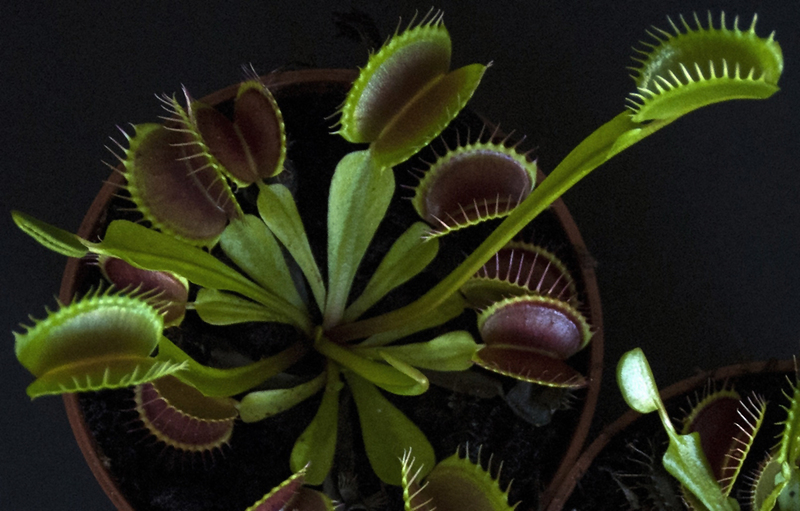 Nevertheless, several variations have been found in wild populations, and hundreds of cultivars have been developed to obtain radically different varieties – there are all-red and all-green plants, as well as plants with giant traps – Dionaea ‘B52’ has traps up to 5 cm long – or others that look deformed, monstrous. I mean, even more monstrous than the normal ones. Of these, my favourite is certainly Dionaea ‘Cupped Trap’, a variety whose trap is fused at the extremities, and can present two or more traps on the same leaf – it looks like a creature out of an 80s sci-fi/horror movie, and this probably tells us something about the wicked minds of the people who grow carnivorous plants. It is interesting to note how these mutations have never improved the plant’s evolutionary design; quite the contrary, they often prevent the trap’s proper functioning because the trap’s outer teeth no longer interlock and can’t properly close above a certain size. This may be the reason why the flytrap will never be able to eat anything bigger than flies, which is probably good news for everyone.